Keywords: silver; silver sulfadiazine; antimicrobial mechanisms; bacterial resistance. Silver has been used in a wide range of topical antimicrobial applications to reduce the risk of wound infection and to treat infected wounds. Renewed interest in the use of dressings containing silver has arisen because of advances in impregnation techniques and polymer technology, coupled with the prevalence of bacterial resistance to antibiotics. Safe and effective use of silver dressings is essential to prevent the problem of emerging bacterial resistance. In its latest position document on Management of Wound Infection, the European Wound Management Association has examined the role of topical antimicrobial therapy in the management of acute and chronic wounds . It has also provided advice on the use and selection of antimicrobial dressing products across a range of wound types. An important element in bacterial management has been the renewed interest in the use of ionic silver for a wide range of topical antimicrobial applications aimed at reducing the risk of wound infection, facilitating the treatment of infected wounds and reducing the incidence of hospital-acquired infections. This is largely attributed to its bactericidal efficacy at low concentration and its relatively limited toxicity to human cells. This paper reviews the background to the rise in use of silver for wound care and the potential for emergent bacterial resistance to silver. Silver has been used for centuries. Originally, silver vessels were used to preserve water, and its use for medicinal purposes is documented from 750AD. The first scientific papers describing the medical use of silver have been attributed to Cred� for the prevention of eye infection in neonates in 1881 and for internal antisepsis in 1901 . In 1965, Moyer et al were the first to report the antibacterial activity of compresses soaked with 0.5% silver nitrate applied to extensive burns  . The efficacy of silver nitrate against Pseudomonas aeruginosa was viewed as an important benefit because this micro-organism was considered a primary cause of death in patients with extensive burn wounds   . Complications associated with silver nitrate compresses led, in 1968, to the use of silver sulfadiazine (silver combined with a sulfonamide) . Silver sulfadiazine was reported to be more effective than silver nitrate, particularly against Gram-negative bacilli . Today, the British National Formulary  and Martindale: The complete drug reference  mention the use of silver sulfadiazine in a number of applications. The use of silver sulfadiazine is recommended for the treatment of mainly superficial and mainly deep dermal burns  , but also for the treatment of wounds , while silver nitrate finds application for the removal of warts . Subsequent attempts to improve antimicrobial efficacy for the treatment of burns included the development of formulations combining silver sulfadiazine and chlorhexidine . The combination of silver sulfadiazine and cerium nitrate (Flammacerium) is also widely used in burn units . The recent renewed interest in the clinical use of dressings containing silver arises from advances in impregnation techniques and polymer technologies coupled with the increase in prevalence of bacterial resistance to antibiotics. There are now a number of silver-based dressings on the market that aim to improve healing primarily by controlling the wound bioburden. These products vary widely in the structure, formulation and concentration of silver used. An important measure of their worth is their ability to satisfy the criteria for the ideal topical antimicrobial dressing (Table 1). Studies have shown that dressings and preparations containing silver have a better antimicrobial efficacy than do silver nitrate or silver sulfadiazine used in solution  . In addition, bactericidal activity may be enhanced when silver sulfadiazine is combined with other antiseptics (such as chlorhexidine or povidone iodine). These combinations could decrease the likelihood of emerging bacterial resistance, but will increase cytotoxicity . The combination of silver sulfadiazine and cerium in clinical practice has been comprehensively reviewed . Avoids wound trauma on removal. Despite its long use, the bactericidal mechanisms of action of silver are not fully understood. Russell and Hugo have provided a comprehensive review . Referred to as a 'general protoplasmic poison', ionic silver will interact with multiple target sites within the cell (Figure 1). Figure 1 - Interactions of silver with micro-organisms. Most of the sensitive sites are likely to be proteinaceous in nature and their alterations will result in structural and metabolic cell disruption. In addition to its bactericidal activities, silver is also fungicidal and virucidal. Its molecular mechanisms of fungicidal action are similar to those against bacteria with protein damage through sulfydryl group interactions. Its virucidal mechanisms of action involve alteration of viral protein, but also damage to the viral nucleic acid . There is well-documented evidence for bacterial resistance to silver. Cason et al reported this in Gram-negative bacilli in burn wounds as early as 1966 . In the late 1970s there were several reports of outbreaks of burn wound infection or colonisation by Gram-negative isolates resistant to silver sulfadiazine (Enterobacter cloacae , Providencia stuartii , P. aeruginosa ) and to silver nitrate (P. aeruginosa , Salmonella typhimurium ). It is clear that exposure to silver might select resistant micro-organisms and this could play an important part in the predominance of intrinsically silver-resistant bacteria where silver is widely used . Li et al reported the development of bacterial resistance to high concentrations of silver (>1024ppm) by repeated exposure to increasing concentrations in vitro . The precise mechanism by which these concentrations were achieved is unclear. reduction of the metal ions to a less toxic oxidation state. Decreasing accumulation of silver has been well described and involves two main processes: the reduction of silver uptake and the efflux of ionic silver. Decreasing uptake, by affecting a non-specific transporter, has been described for other metallic salts where metal tolerance occurred . Efflux pumps are increasingly associated with antimicrobial resistance and their involvement in silver resistance is no exception . In addition, the chelation of silver by the sulfydryl groups of metal-binding proteins, resulting in the formation of an inactive, insoluble silver sulfide, has been described . Furthermore, resistance to silver by P. aeruginosa has been linked to the reduction of silver ions to the metallic form. Compared with the implication of decreased accumulation in silver resistance, these mechanisms have not been well investigated. The occurrence of plasmid-mediated resistance is a particular concern; this has been well documented in a number of Gram-negative bacteria, such as P. aeruginosa, P. stutzeri, Citrobacter spp., Serratia marcescens and Salmonella enterica serovar Typhimurium. Plasmid-mediated resistance has been associated with co-resistance to other biocides and antibiotics . This is a particularly worrying prospect because the emergence of multiresistant micro-organisms can be a serious threat to antibiotic prophylaxis and treatment. When faced with an outbreak of resistance, healthcare professionals should keep in mind the fact that some strains might also be resistant to topical antimicrobial agents. Furthermore, resistant clones might persist in the clinical setting . Silver has an established history of preventing infection in burn wounds, and the development of novel silver-containing dressings has sparked a new interest in its use for wound management. Silver has many properties that make it suitable for this purpose. Combining silver with suitable dressings has been shown to decrease some of the unwanted effects associated with the broad-spectrum, non-specific antimicrobial properties of silver, such as toxicity and staining, while increasing the overall antimicrobial efficacy. The safe and effective use of silver dressings is critical to prevent the problem of emerging bacterial resistance, which arises when micro-organisms are in contact with a low (sub-inhibitory) concentration of silver. Most studies on the emergence of bacterial resistance to silver were not related to the use of silver in dressings. However, it could be important to survey silver resistance (or the lack of it) for such an application in situ, or to study the likelihood of the development of such resistance in vitro. The European Wound Management Association has developed practical advice on the use of topical antimicrobials . This article was recently reprinted in the EWMA Journal 2006; 6(1): 5-7. The 2006 EWMA position document on 'Management of wound infection' is available from http://www.ewma.org and contains further discussion of the use of silver and other topical antimicrobials in the management of wound infection. 1. European Wound Management Association. Position Document: Management of Wound Infection. London: MEP Ltd, 2006. 2. Russell AD, Hugo WB. Antimicrobial activity and action of silver. Prog Med Chem 1994; 31: 351-70. 3. Moyer CA, Brentano L, Gravens DL, Margraf HW, Monafo WW. Treatment of large human burns with 0.5% silver nitrate solution. Arch Surg 1965; 90: 812-67. 4. Klasen HJ. A historical review of the use of silver in the treatment of burns. II. Renewed interest for silver. Burns 2000; 26(2): 131-8. 5. Cason JS, Lowbury EJ. Mortality and infection in extensively burned patients treated with silver-nitrate compresses. Lancet 1968; 1(7544): 651-4. 6. Cason JS, Jackson DM, Lowbury EJ, Ricketts CR. Antiseptic and aseptic prophylaxis for burns: use of silver nitrate and of isolators. Br Med J 1966; 2(525): 1288-94. 7. Fox CL. Silver sulfadiazine-a new topical therapy for Pseudomonas in burns. Therapy of Pseudomonas infection in burns. Arch Surg 1968; 96(2): 184-8. 8. Mehta DK, editor. British National Formulary. Issue 50. Oxford: Pharmaceutical Press, 2005. 9. Sweetman S, editor. Martindale.The Complete Drug Reference. (34th edition). London: Pharmaceutical Press, 2004. 10. Monafo WW. Initial management of burns. N Engl J Med 1996; 335(21): 1581-6. 11. Clarke J. Burns. Br Med Bull 1999; 55(4): 885-94. 12. Sterling JC, Handfield-Jones S, Hudson PM, British Association of Dermatologists. Guidelines for the management of cutaneous warts. Br J Dermatol 2001; 144(1): 4-11. 13. Fraser JF, Cuttle L, Kempf M, Kimble RM. Cytotoxicity of topical antimicrobial agents used in burn wounds in Australasia. ANZ J Surg 2004; 74(3): 139-42. 14. Garner JP, Heppell PS. The use of Flammacerium in British Burns Units. Burns 2005; 31(3): 379-82. 15. Wright JB, Lam K, Hansen D, Burrell RE. Efficacy of topical silver against fungal burn wound pathogens. Am J Infect Control 1999; 27(4): 344-50. 16. Yin HQ, Langford R, Burrell RE. Comparative evaluation of the antimicrobial activity of ACTICOAT antimicrobial barrier dressing. J Burn Care Rehabil 1999; 20(3): 195-200. 17. Garner JP, Heppell PS. Cerium nitrate in the management of burns. Burns 2005; 31(5): 539-47. 18. Maillard J-Y. Virus susceptibility to biocides: an understanding. Rev Med Microbiol 2001; 12(2): 63-74. 19. Gayle WE, Mayhall CG, Lamb VA, Apollo E, Haynes BW. Resistant Enterobacter cloacae in a burn center: the ineffectiveness of silver sulfadiazine. J Trauma 1978; 18(5): 317-23. 20. Wenzel RP, Hunting KJ, Osterman CA, Sande MA. Providencia stuartii, a hospital pathogen: potential factors for its emergence and transmission. Am J Epidemiol 1976; 104(2): 170-80. 21. Bridges K, Kidson A, Lowbury EJ, Wilkins MD. Gentamicin- and silver-resistant pseudomonas in a burns unit. Br Med J 1979; 1(6161): 446-9. 22. McHugh GL, Moellering RC, Hopkins CC, Swartz MN. Salmonella typhimurium resistant to silver nitrate, chloramphenicol, and ampicillin. Lancet 1975; 1(7901): 235-40. 23. Bridges K, Lowbury EJ. Drug resistance in relation to use of silver sulphadiazine cream in a burns unit. J Clin Pathol 1977; 30(2): 160-4. 24. Silver S. Bacterial silver resistance: molecular biology and uses and misuses of silver compounds. FEMS Microbiol Rev 2003; 27(2-3): 341-53. 25. Li XZ, Nikaido H, Williams KE. Silver-resistant mutants of Escherichia coli display active efflux of Ag+ and are deficient in porins. J Bacteriol 1997; 179(19): 6127-32. 26. Nies DH. Microbial heavy-metal resistance. Appl Microbiol Biotechnol 1999; 51(6): 730-50. 27. Liau SY, Read DC, Pugh WJ, Furr JR, Russell AD. Interaction of silver nitrate with readily identifiable groups: relationship to the antibacterial action of silver ions. 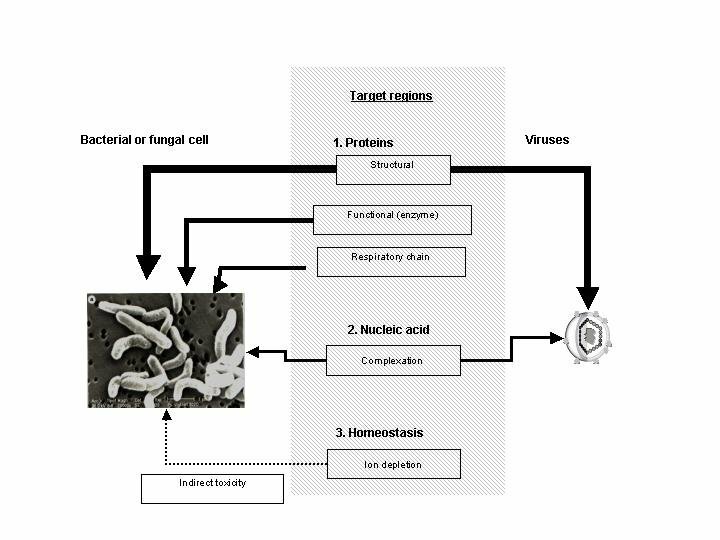 Lett Appl Microbiol 1997; 25(4): 279-83. 28. Gupta A, Matsui K, Lo JF, Silver S. Molecular basis for resistance to silver cations in Salmonella. Nat Med 1999; 5(2): 183-8. 29. Gupta A, Phung LT, Taylor DE, Silver S. Diversity of silver resistance genes in IncH incompatibility group plasmids. Microbiology 2001; 147(Pt 12): 3393-402.